Kaoruko is a very boyish girl who attended Fujigaya around the same time Sugimoto Shinako did. She was the pitcher for the school's baseball team. She falls for Shinako after she catches the upperclassman watching her during baseball practice. 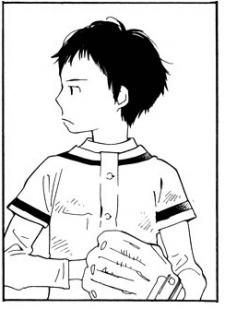 Shinako compliments her, and it seems that was all it took for her to fall under the infamous Sugimoto's charm. Kaoruko mustered up the courage to ask her to be her girlfriend and Shinako agrees to. The relationship becomes very strained as people sneer at Kaoruko telling her that the only reason someone like Shinako would pay attention to her is because she lost a bet or because she pitied her. Unable to cope with the jeers and jealousy from other Shinako admirers, Kaoruko suggests that they break up. However, Shinako tells Kaoruko that she's her type and that they should continue dating despite what other people think. In the end, Kaoruko decides to break up with Shinako because she realises that she is just one out of several people that her upperclassman was simultaneously dating. She says that her pride would never let her put up with Shinako's polyamorous nature. Kaoruko eventually grows her hair longer and began wearing more feminine clothing, as one of the reasons Shinako took a liking to her was because she looked like a boy. Now a grown woman, she still meets up with Shinako calling their relationship an "on again, off again" thing. Kaoruko is still very much in love with the other woman but knows that Shinako had never loved her and will never love her back.